I’ve come to appreciate the rhythms of the daily routines with the kids, so although I enjoy my time off, I still look forward to starting up again after break. It feels good to be back in the happy chaos of the high school homes as we all get settled back in. 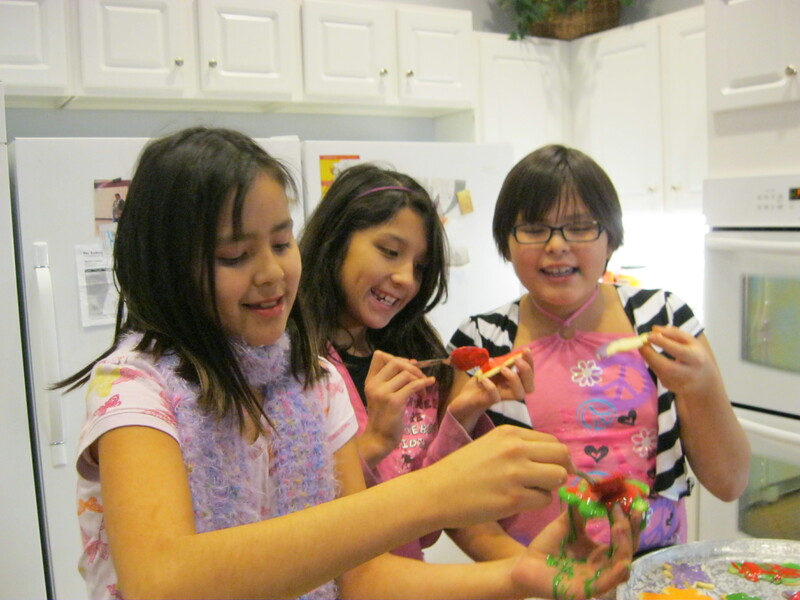 We had so much fun singing, baking and laughing! 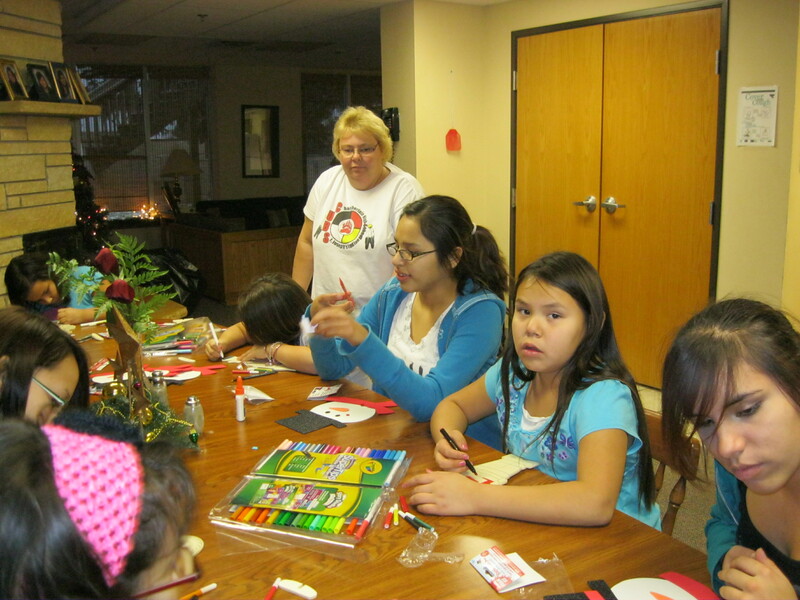 We left off last year baking cookies and making ornaments with girls from the younger homes. This involved Christmas carols, flour and frosting on the floor, and twiddly bits of glitter and goo gobs in the rug. These are hallmarks of a really good day: singing and a medium-sized mess. This was a departure from our usual after school routine, which is a jumble of snacks, charges, appointments and updates on the new topics at Chamberlain High School. All of this is accompanied by the pop/hip hop soundtrack of someone’s laptop playing full blast and the constant clicking of cell phone keys texting. Morning routines are not quite so lively. They are more like a cheesy suspense novel. Everything starts off predictably slow, with sleepy-eyed prayers and bits of toast. Then comes the rising action—the clock is ticking and our heroine is in a race against time to complete her mission before the bus arrives. Will she get her charge done? Will that bathroom sink pass inspection or will she have to go for a do-over? The bus is out front with the lights flashing, as we bite our nails (and tongues, because nagging is just NOT going to save the day). Will she find that Math book? WILL HER HAIR LOOK OK?? Tune in and find out. Singing and a medium sized mess! The best part of the day is still the short window of time between curfew and bedtime. Theoretically, we are winding down for the day. We’ll have snacks and Sleepy Tea. Prayers are one part of the day when we can usually have all the girls together for a few quiet cell-phone free minutes. The girls usually have friends and family members that they want to pray for. Sometimes they pray for better grades or snow days. We have lists of intentions from benefactors that get added in as well. It may sound a bit corny, but I really enjoy prayer time. It’s a privilege to be able to talk about spirituality openly with the kids, and it makes for a positive end to our day. Well, sort of. Once bedtime actually arrives, we are back into chaos with everyone remembering “one last thing” that has to be done right now. The next five minutes will be like herding frogs. I find myself smiling when I remember these things. I can’t wait to get caught up on all the news with the girls. Best of all, today is present-wrapping day for the high school program. This involves Christmas carols, pizza, tons of wrapping paper and tape. In other words: singing and a medium size mess. We’re off to a great start! 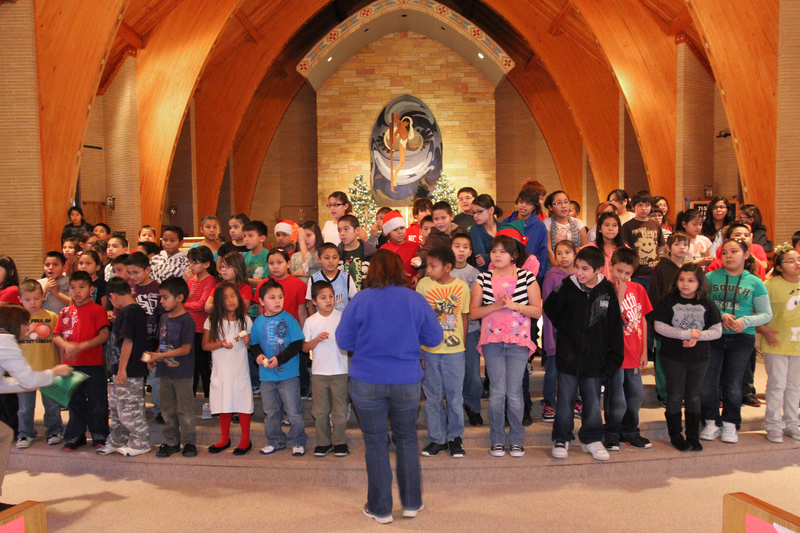 The kids had so much fun at their Christmas concert! For grades 1 – 8, the first semester is in the books. Our staff still has a couple of days of in-service, but classes wrapped up today and the students are now on Christmas break. The high school students still have another week of classes. 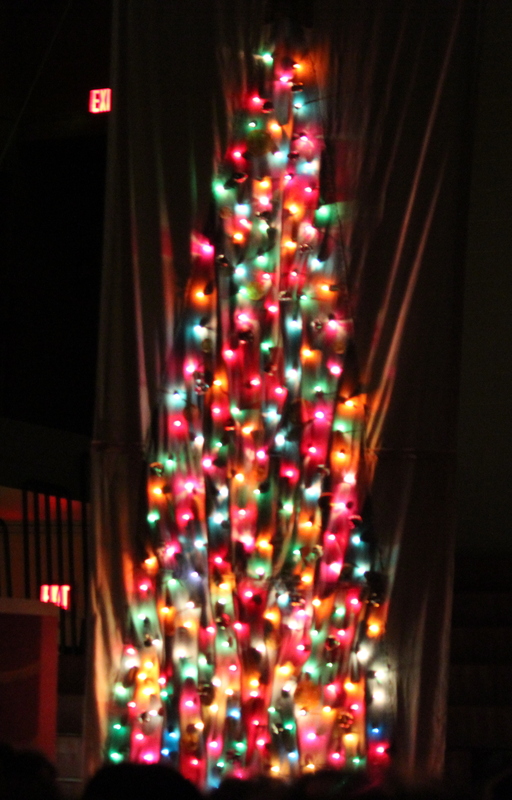 Today’s student Christmas program was a big hit. Most of the performances were done in larger groups, but three of our students had enough confidence and stage presence to serve as Masters of Ceremony. I was also delighted to see a few students brave enough to sing a duet. Sixth graders Caden and James did a rap song about Christmas that had the chapel rocking. We had an appearance by Santa and a teacher led Elvis rendition of “I’ll have a Blue Christmas Without You”. The families who were able to come for the show, were all invited to lunch at the school cafeteria before hitting the road. 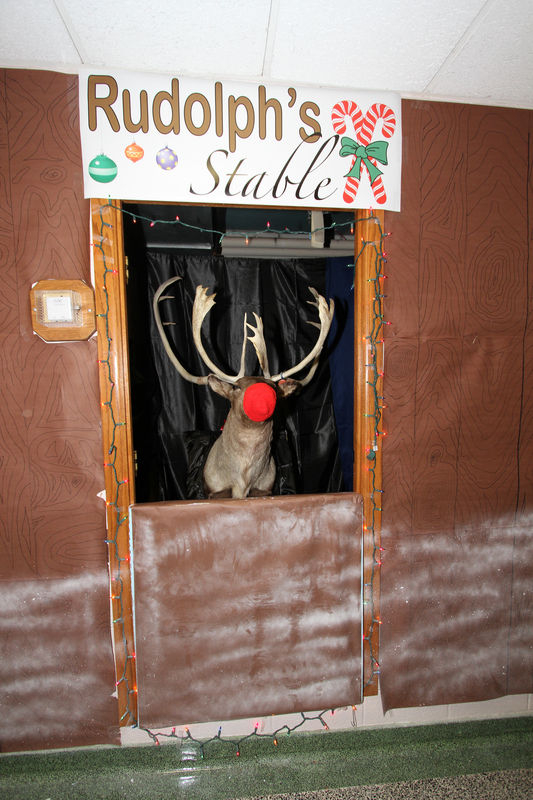 Here’s just a glimpse of Santa’s Workshop at St. Joseph’s Indian School. I faced one of the tougher challenges of my job when I was on a three panel team to judge the decoration competition in the basement of the Benedict Building between Human Resources and Facilities. They worked frantically this week to transform the offices into a winter wonderland. HR made their section of office look like a Ginger Bread house, complete with gum drops on the wrapping paper walls. Problem was we spied a few 1st graders on their way home from school plucking them from the wall to have a snack! HR’s was more beautiful and appealing to the eye, but Facilities brought in a secret weapon – students dressed up as elves pretending to use the tools to make toys at a table labeled “Santa’s Workshop”. With no collusion at all, when we added up the points for originality, arrangement, theme and overall presentation, we ended up with a real honest to goodness tie. But everyone who walked the halls had a smile on their face and felt like a winner.